Lord knows I love me some MAC so when I was in New York, I couldn't not pick up any MAC products. 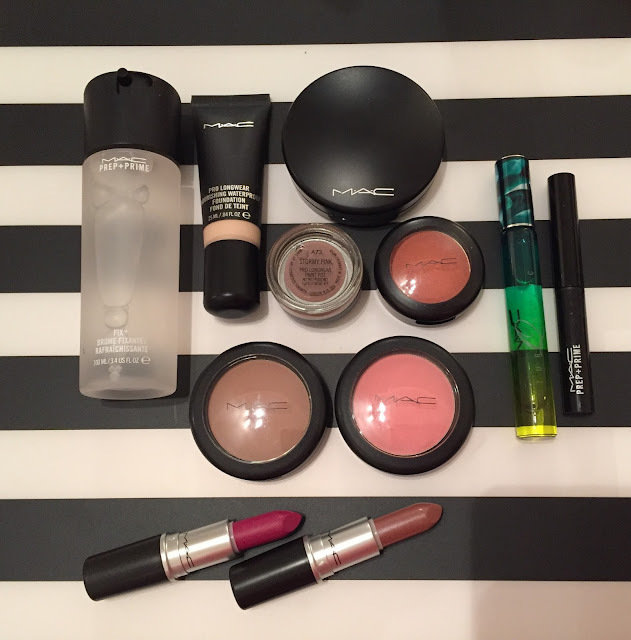 The MAC Holiday Kits this year didn't float my boat as they have done in previous years so I wasn't too enthused about those but I did have a couple of items on my wishlist that I was keen to pick up. First up was the Irresistibly Charming Glitters and Pigments in Gold. There was 25% off all MAC holiday gift sets in Macys so it would have been rude not to. 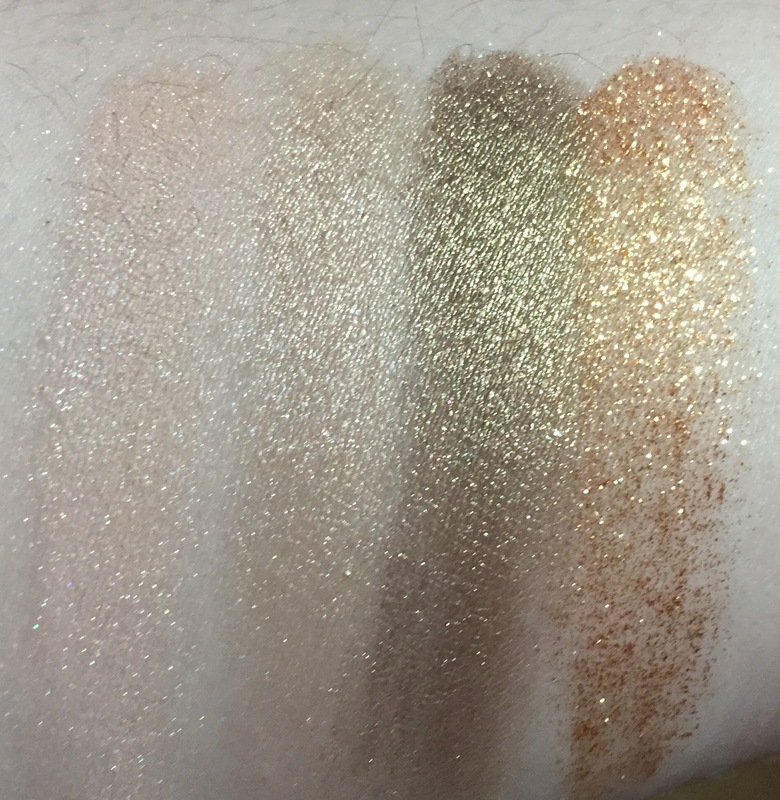 The colours included are from L-R: pigments in Naked, Blonde's Gold, Out all Night and a glitter in Reflects Bronze. 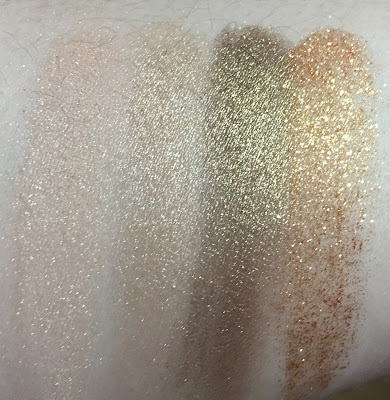 The pigments have 2.4g of product in each and the glitter has 1.9g, which is plenty as I have never been able to get to the bottom of a jar of MAC pigment. In the Cosmetic Company Outlet (CCO) in Woodbury Common, I picked up the Pro Longwear blushes in Rosy Outlook and Baby Don't Go. Both were on my wishlist for a while- the former being a gorgeous natural flush colour and the latter being a lovely colour for a light contour on pale skin. I also picked up the Pro Longwear Eyeshadow in Hot Paprika and I love wearing this in the crease especially. In my mind, it's a little too red to wear all over the lid - it makes me look like I've been in a fight, but popped in the crease with some other neutrals, it is just perfection. I had not heard of this before I found it but I am so glad I got it. 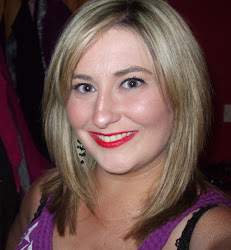 I got another MAC Fix + and Prep + Prime Lip - neither of which are very exciting but anything to help your face last longer! I picked up two new lipsticks also - Midimauve which is a Lustre finish rosy mauve colour and Flat Out Fabulous, a gorgeous matte smokey magenta. In the CCO, I picked up a MAC Turquatic Rollerball perfume. I've long time heard about this but never actually got the chance to pick one up so I got it when I was there, It smells great, I just wish that this was a spray instead of rollerball, I'm really not a rollerball gal! I got a backup of my current favourite MAC foundation, the Pro Longwear Nourishing Waterproof Foundation. I really love this foundation- I think it is my favourite MAC foundation to date, I already raved about it in this post. Finally, I got a brand new paint pot in the shade Stormy Pink. The colour is a gorgeous smokey pink, similar to the Maybelline Color Tattoo in Vintage Plum. My MAC haul probably would have been more substantial if the foreign exchange rate was more favourable but given how weak the euro is against the dollar currently, I preferred to pick up items from brands that are not so easily available here. All in all, I don't think I did too badly and I am very happy with my picks. If there is anything in particular you are interested in seeing in further detail, do let me know. Next haul tomorrow is a Bath and Body Works haul so stay tuned for that!